I love the NY Times, 36 Hours column. I read it every week as inspiration for travel and go back to specific cities when I’m planning to travel. I love it so much, that I’m going to start my own series of places I’ve visited for you. But because I’m mostly about food, with other adventures smattered in between, my 36hrs, (or so) will revolve around food with only a gentle sprinkling of actual touristy stuff in between. It’s fitting that I’d start this off with Seattle considering it’s the city I most often spend 36 hours in. It’s also the city that people ask me for food recommendations most often. I can’t give you every suggestion I have for SEA here, but if you are planning a trip to the Emerald City any time soon, let me know because I have tons of food suggestions! 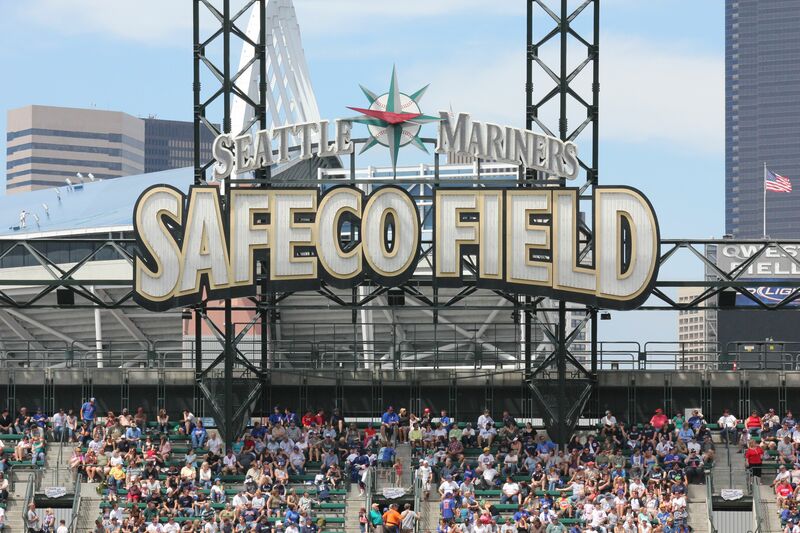 FRIDAY PM – after checking into a hotel, I’ve most likely booked on Priceline for $100 or less make your way down to Safeco for Mariner’s game. You can bring food into the ballpark so you can stop at Uwajimaya Japanese grocery store to pick something up. Or inside the park, try some garlic fries, (if you’re not afraid of smelling the rest of the night). Find a vendor that’s pouring Pyramid or Blue Moon Hefeweizen, both great choices for a nice summer night. 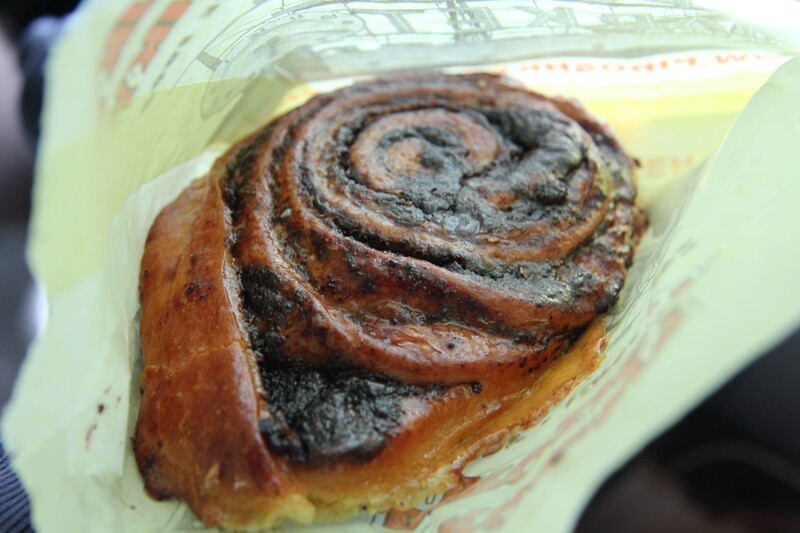 SATURDAY AM – Head down to Pike Place market for some great nibbles! 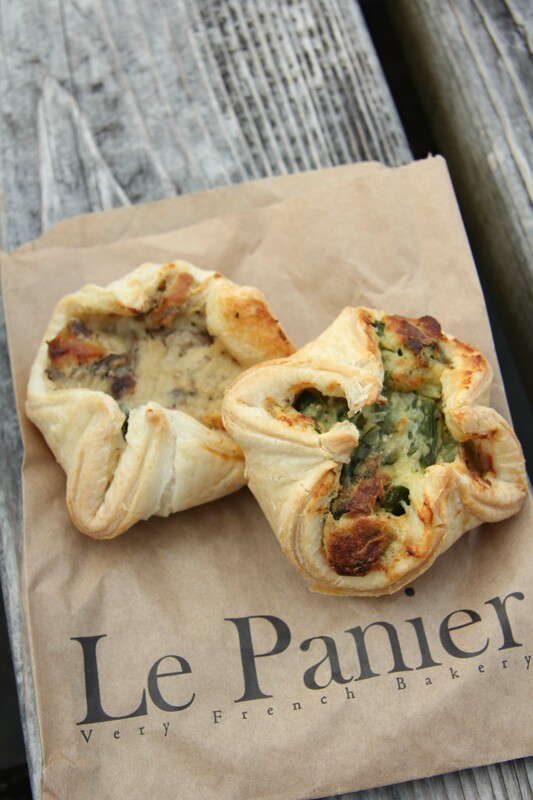 My favorite is Le Panier for a savory pastry. 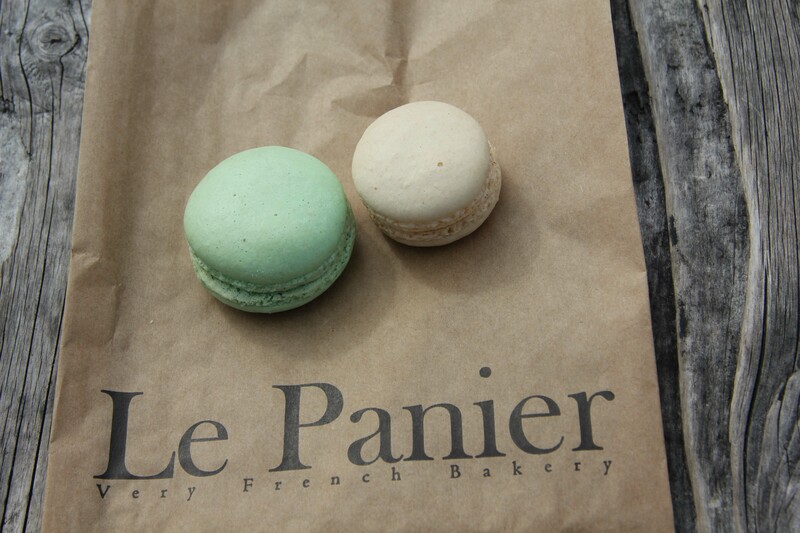 The croissants and macarons are pretty amazing as well. I don’t know what these are actually called, but I like them stuffed with spinach or asparagus or mushroom. Check out the original Starbucks while you’re there if you’re so inclined, but it’s usually packed with tourists. 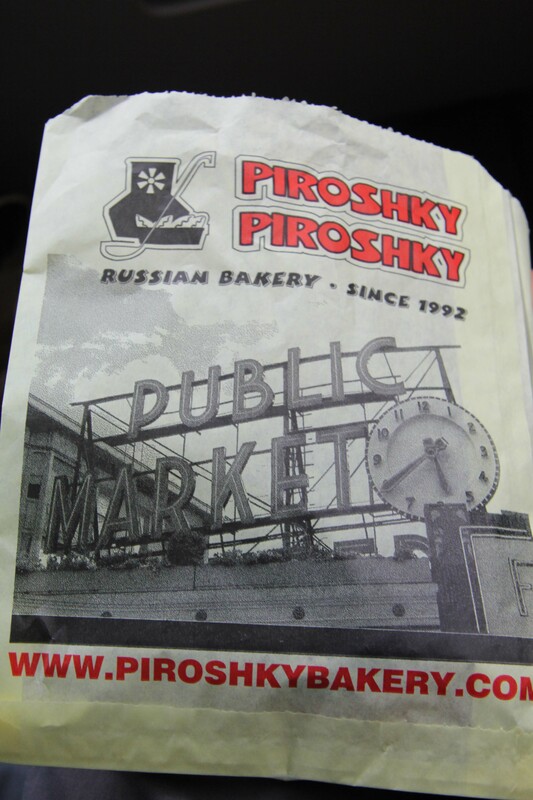 Another good hit at PP is Piroshky Piroshky. If you’re savory, try the ones stuffed with potato and cheese. A fan of sweets will enjoy the cinnamon one. On a sunny day, or at least not raining, it is the Pacific Northwest we’re talking about, take your treats to the area behind the market where there are picnic tables overlooking the water. The view of the water I was referring to is to the left of this photo. 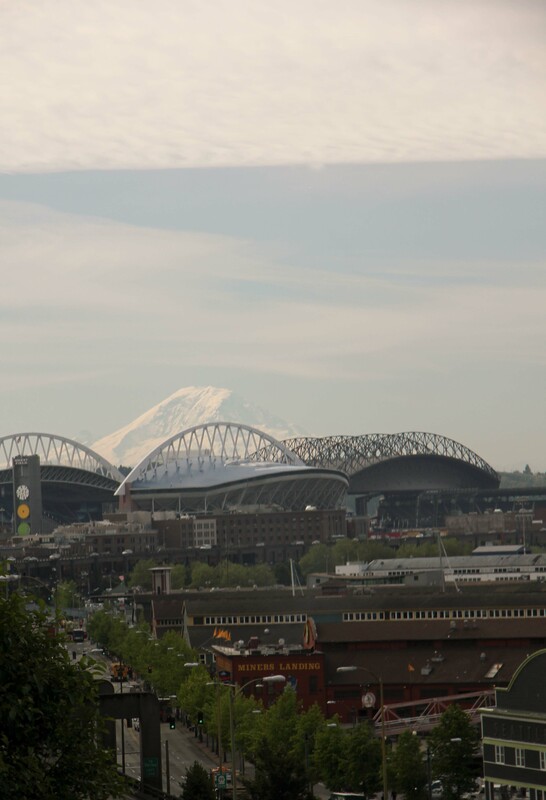 I just like this one of Safeco & Qwest with the mountain in the background. One last stop for a snack for later at Mei Sum bakery. Their BBQ pork buns aren’t the most traditional, but it’s not a bad version of one. If you’re hungry for lunch after this, you’re on your own. But if you’d had enough to tide you over until later try to check one of the Happy Hours that Seattle is famous for. SATURDAY PM – 2 choices here. If you don’t want to get into a car, head over to Serious Pie at least an hour before you think you’re going to be hungry. This place is always busy for dinner, so you need to be prepared to wait. So go, put your name in and leave your cell phone number. Then go out and grab a drink somewhere close by, (at the bar at Lola or Spur are good choices) relax and wait to be called by the restaurant. It may seem like a bit of a production, but the pizza is worth the wait. I’m not going to tell you which pizza to try as they’re all totally unique and satisfaction will be dependant on what you like on a pizza. It’s open for lunch as well so if you can fit this into your appetite mid-day then that’s always an option too! If you have a car, or are willing to take a short taxi ride away. Book a reservation on opentable.com to try out Ethan Stowell’s Anchovies and Olives up in Capitol Hill. The small plates are meant for sharing, but that means that you’ll get to delight in many flavours of crudos, seared fish and beautiful pastas. After dinner, take short walk for a good cocktail in a cool, (if not a bit loud) space. Tavern Law is a throwback to Prohibition with its decor and type of drinks they are serving. Choose from one of the many interesting cocktails they have, or just get the bartender to surprise you! SUNDAY AM – After packing up to go home, one last stop for a delicious brunch at a Seattle favorite, Cafe Campagne. Choose between wonderfully poached eggs or a brioche french toast which is to die for. There’s usually a wait, but if there is you can always do some last minute browsing around Pike Place. Hope you like my suggestions, like I mentioned at the start I have lots of ideas for Seattle so feel free to ask for advice! I’m on vacation right now, and when I get home I’ll add all the details to the restaurants at the bottom as well as any links I may have missed.